Experience First Class at Sea on board Norwegian Joy. 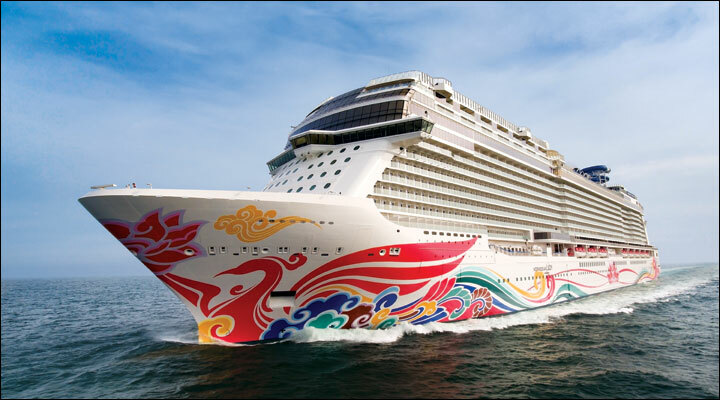 Debuting in China in summer 2017, Norwegian Joy is the fleet's most innovative ship to date. Styled exclusively for Chinese travelers, guests can expect an upscale resort style vacation with world-class entertainment, fine international dining, unrivaled duty-free luxury shopping with the freedom and flexibility found on all Norwegian Cruise Line ships. From top to bottom and from bow to stern, Joy has enough onboard activities to fill every minute of your cruise. Go for the checkered flag on a thrilling two-level racetrack in the middle of the ocean - the first ever at sea. Step inside the all-new Galaxy Pavilion and into a virtual world unlike anything you've ever seen. Immersive virtual reality experiences. Thrilling simulator rides. Interactive video walls. This is just the beginning of an exciting new world to discover. At Serenity Park, catch a glorious sunrise or an afternoon sea breeze. Or take a moment to share your incredible vacation memories with friends back home via fast WiFi service. There's no better place to enjoy a serene setting that is partially covered and designed for you to unwind however you wish.